Slice the crosnes across in 1cm thick slices. Heat the butter in a pot over medium heat, when the foam subsides, add the diced shallot. Cook stirring regularly until translucent and add a pinch of salt and grinding of black pepper, then add the sliced crones. Lower the heat and cook gently for about 5 to 7 minutes and add the cognac; cook for a further 3 to 4 minutes until most of the alcohol has evaporated. Add the chicken stock, lower the heat to minimum and cook uncovered for about 30 to 40 minutes until reduced by one third. Taste for seasoning and add the cream, cook for a further 10 minutes. Finish off with a light pinch of hot cayenne or paprika. 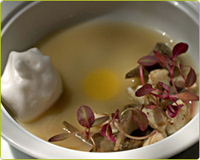 Serve in hot bowls with some crusty bread, or garnish with fresh chopped chives. Bright red currants will also be a great finishing touch. Cut the rhubarb into rough chunks and place in a saucepan, add cold water so it comes up roughly 2cm followed by the sugar. Heat gently and cook until the rhubarb is completely soft – this will take about 10 to 15 minutes. Strain the rhubarb using a fine mesh sieve – you do not want to push the rhubarb through the sieve, as you only want the beautiful fluorescent pink liquid, no pulp. Taste and if you prefer it a bit sweeter, add some sugar, making sure it dissolves completely. Soak the gelatine sheets in cold water, this will soften them. Boil the 250ml of water and pour over the softened gelatin. If the gelatin does not dissolve completely, you can heat it up gently until it does. Mix the gelatin with 250ml of the rhubarb juice. Pour the mixture into a bowl or individual molds and place in the fridge. The rhubarb jelly will take at least 12 hours to set completely. 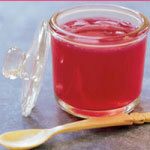 Place the bowl/container with the jelly in warm water for a few seconds - this will release the jelly from the mold. Serve on a white plate with fresh cream on the side. Place the cut rhubarb in a pan with the sugar and any spices you want…we recommend you keep it simple, no more than two. Add a little water, about a tablespoon per 150gr and cook on low heat for 10 to 15 minutes, until the rhubarb is completely soft but still holds some shape. It is now ready to serve on its own or with some natural yoghurt, vanilla ice cream, double cream or crème Chantilly.